The precise duplication of chromosomal DNA is essential for preserving the genetic complement of the cell. To ensure that chromosomes only replicate once per cell cycle the process of chromosome duplication is divided into discrete steps. The first step is licensing of DNA replication, also termed pre-replicative (pre-RC) complex formation. Pre-RC formation occurs during late mitosis and during G1 phase and results in the loading of the MCM2-7 helicase onto origin DNA. Pre-RC formation involves binding of Cdc6 to the DNA-bound origin recognition complex (ORC) (Speck et al., 2005; Speck and Stillman, 2007). The ORC-Cdc6-DNA complex cooperates with Cdt1 to load the MCM2-7 helicase on double-stranded DNA. In 2009 the Group published the complete reconstitution of Saccharomyces cerevisiae pre-RC formation with purified proteins. We showed that MCM2-7 is a hexamer before loading and that the complex is transformed into a double-hexamer during pre-RC formation. Figure 1 summarises the work done in this project. Click on it to enlarge. The assay uses biotinylated DNA bound to streptavidin-coated magnetic beads (A). The indicated proteins were incubated with origin DNA. The high salt wash removed ORC, Cdc6 and Cdt1 but kept loaded MCM2-7 associated with DNA (B). Electron micrograph of metal-shadowed DNA with two loaded MCM2-7 double-hexamer complexes (C). How is the MCM2-7 ring opened? How does ORC-Cdc6 promote double-hexamer formation? Clearly, the mechanism of helicase loading needs to be addressed, but a deep understanding of the regulation of this process appears equally important. Reduced MCM2-7 loading is observed in genetic diseases and during tumorigenesis and renders cells sensitive to DNA damage and promotes double-strand breaks. On the other hand, the DNA licensing activity must be inactivated prior to S-phase. Failure to inactivate only a single helicase loading complex results in re-replication and severe genomic rearrangements. Evrin, C., Clarke, P., Zech, J., Lurz, R., Sun, J., Uhle, S., Li, H., Stillman, B., Speck, C. (2009). A double-hexameric MCM2-7 complex is loaded onto origin DNA during licensing of eukaryotic DNA. Proceedings of the National Academy of Sciences of the United States of America 106, 20240-20245. Based on the coordinated and distinct structural changes in MCM2-7, which are promoted by ORC, its cofactors Cdc6 and Cdt1, we propose a model that explains how the MCM2-7 double-hexamer assembles onto DNA. Refer to the diagram on the right. Click on it to enlarge. ORC binds in an ATP-dependent way to the replication origin (A). In G1 phase, Cdc6 is recruited to ORC and the ORC/Cdc6 complex contributes to origin specificity (B). Cdt1 forms a complex with MCM2-7 and this interaction is required for the binding of Cdt1/MCM2-7 to ORC/Cdc6. Initially only one Cdt1/MCM2-7 heptamer is recruited to ORC/Cdc6. In the absence of Cdc6 ATP-hydrolysis, Cdt1 is greatly stabilized in this initial ORC/Cdc6/Cdt1/MCM2-7 (OCCM) complex (C). ATP-hydrolysis by Orc1 and Cdc6 results in rapid Cdt1 release and formation of an ORC/Cdc6/MCM2-7 (OCM) complex (D). 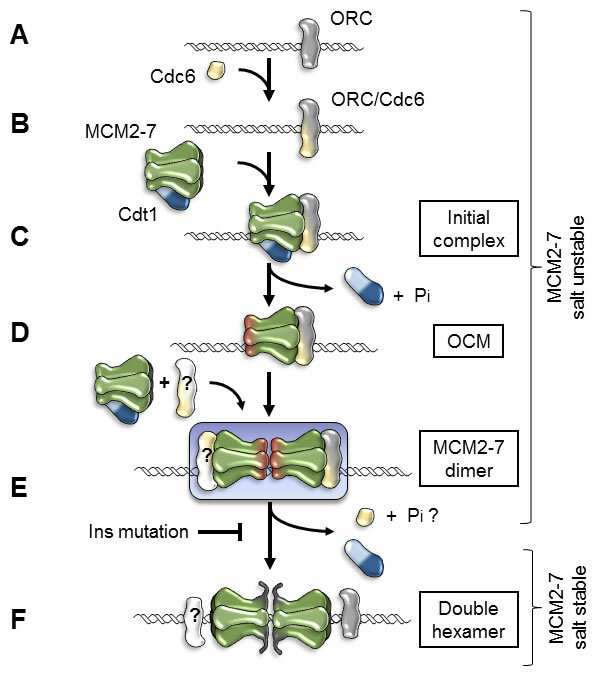 The OCM complex, but not the initial complex, is competent for MCM2-7 dimerization (E). It is not yet clear if one or two ORC/Cdc6 complexes participate in MCM2-7 dimerization or when DNA loading occurs. After initial dimerization, several important changes occur: the MCM2-7 N-termini are exposed, rendering the complex competent for DDK mediated activation in S-phase; the stable MCM2-7 double-hexamer forms around ds-DNA; ORC and Cdc6 are released, and finally Orc1 ATP-hydrolysis occurs to allow another round of MCM2-7 loading (F). Evrin, C., Fernández-Cid, A., Zech, J., Herrera, M. C., Riera, A., Clarke, P., Brill, S., Lurz, R., Speck, C. (2013). In the absence of ATPase activity, pre-RC formation is blocked prior to MCM2–7 hexamer dimerization. Nucleic Acids Research 41, 3162-3172. Riera, A., Tognetti, S., Speck, C. (2014). Helicase loading: How to build a MCM2-7 double-hexamer. Seminars in Cell & Developmental Biology 30C, 104-109. In budding yeast, the MCM2-7 helicase needs to be imported into the nucleus prior to pre-RC formation and this reaction is dependent on the Cdt1 protein (A). The question of how Cdt1 recruits MCM2-7 towards ORC/Cdc6 has recently been under intense scrutiny. Using a reconstituted system employing purified proteins we dissected the process in more detail. We and others found that for MCM2-7 recruitment to origin DNA, ORC, Cdc6 and Cdt1 are required (A). Then we described in 2012 that in the absence of ATP-hydrolysis an ORC/Cdc6/Cdt1/MCM2-7 (OCCM) complex is formed. Although all Mcm subunits are highly homologous, containing a C-terminal AAA+ and an N-terminal domain, individual Mcm subunits have specialised functions. In a series of experiments we showed that a C-terminal extension in Mcm6 contains an inhibitory domain, which blocks OCCM formation in the absence of Cdt1. 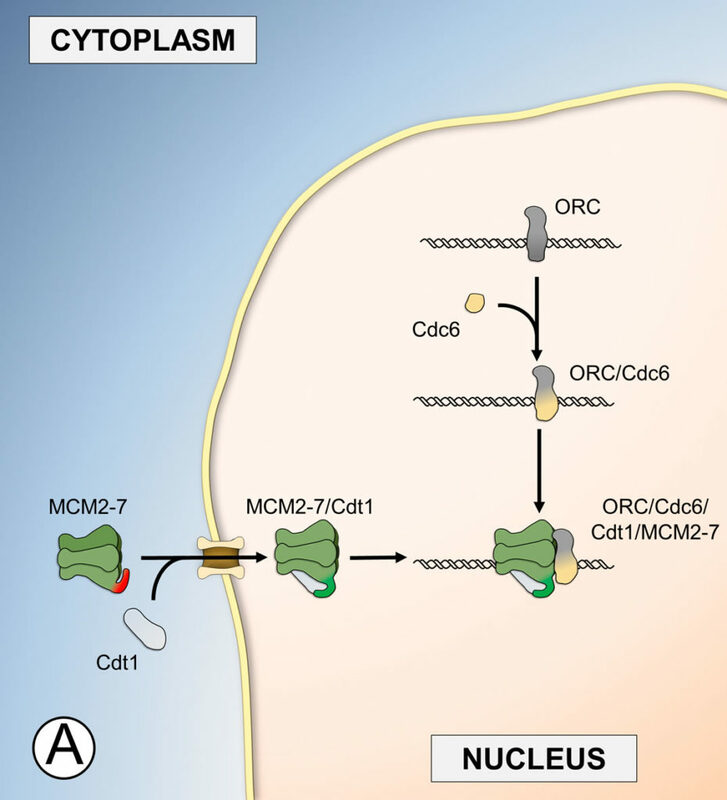 Indeed, MCM2–7-ΔC6, which is missing a conserved Mcm6 C-terminus, can bind to ORC/Cdc6 in a Cdt1-independent manner, while point mutants that interfere with the specific Cdt1-Mcm6 interactions block OCCM formation. 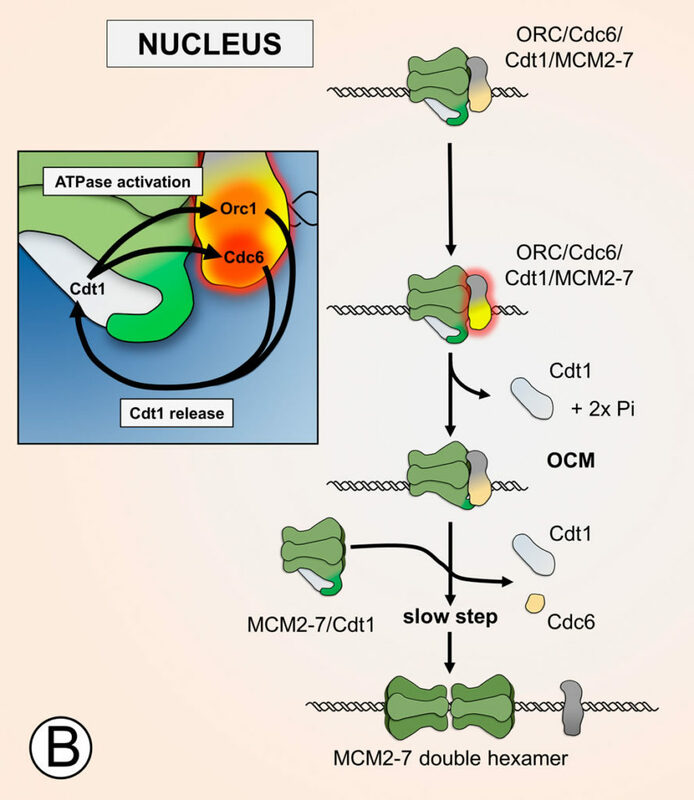 As ATP-hydrolysis during pre-RC formation promotes Cdt1 release, we hypothesized that a productive Cdt1-Mcm6 interaction could be required to induce Orc1 and Cdc6 ATPase activity (B). In fact, we observed that an ORC/Cdc6/Cdt1/MCM2-7-ΔC6 complex blocked ATP hydrolysis, and that Cdt1 addition to ORC-Cdc6 was not sufficient to induce ATP-hydrolysis. Furthermore, we found that MCM2-7-ΔC6 also blocked Cdt1 release during pre-RC formation. Thus, the Mcm6-C terminus and Cdt1 have besides their role in nuclear import and auto-inhibition another important function in promoting ATP hydrolysis and in facilitating Cdt1 release (B). Fernández-Cid, A. *, Riera, A. *, Tognetti, S., Herrera, M. C., Samel, S., Evrin, C., Winkler, C., Gardenal, E., Uhle. S., Speck, C. (2013). An ORC/Cdc6/MCM2-7 complex is formed in a multistep reaction to serve as a platform for MCM double-hexamer formation. Molecular Cell 50, 577-588. The eukaryotic replicative helicase, MCM2-7, is a hetero-hexamer, the six distinct subunits of which assemble into a ring shaped complex. The central channel of the ring is wide enough to accommodate double-stranded DNA. Figuring out how the helicase loader interacts with the large helicase is instrumental to understanding the mechanism of helicase loading and could also inform us about the MCM2-7 double-hexamer formation process. Structural information is key to analysing complex reactions. Unfortunately, crystallographic approaches for the analysis of dynamic and flexible complexes are usually very challenging. However, cryo-electron microscopy (cryo-EM) has the potential to visualize the stable envelope of a protein complex and — in combination with specific labelling approaches — this technique can even pin-point the location of individual subunits within the EM structure. We have recently employed cryo-EM to study helicase loading in collaboration with Huilin Li (Brookhaven National Laboratory) and Bruce Stillman (Cold Spring Harbor Laboratory). By using ATPγS, an ATP analogue, which can be only very slowly hydrolysed, we successfully captured a helicase loading intermediate. This complex, which contains all 14 pre-RC polypeptides, reveals for the first time how the eukaryotic helicase interacts with its loader. The structure identifies how ORC/Cdc6 and Cdt1/MCM2-7 interact with each other. The C-terminal section of MCM2-7 latches on the AAA+ ATPase domains of ORC/Cdc6, which leaves the MCM2-7 N-termini available to interact with a second MCM2-7 hexamer, suggesting a route for MCM2-7 double-hexamer assembly. Especially ORC/Cdc6 undergo significant structural changes upon OCCM formation. While ORC/Cdc6 is nearly flat, ORC/Cdc6 within the OCCM adopt a dome shape with the AAA+ domains now pointing towards the MCM2-7 C-termini. 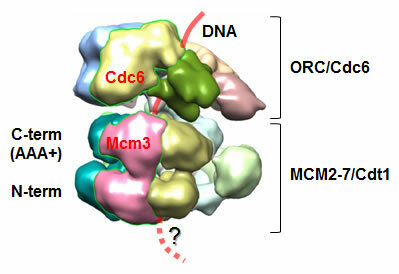 Interestingly, the structure shows that Mcm3 and Cdc6, which we and others found to be essential for OCCM formation, are positioned next to each other, although they do not interact directly. Thus, the Mcm3 C-terminus becomes potentially rearranged during initial ORC/Cdc6-Cdt1/MCM2-7 interaction. Most contacts between ORC/Cdc6 and Cdt1/MCM2-7 are on one side of the complex. It remains unknown whether these interactions are required for helicase loading or alternatively function to remodel the complex for MCM2-7 double-hexamer formation. Sun, J. *, Evrin, C.*, Samel, S. A., Fernández-Cid, A., Riera, A., Kawakami, H., Stillman, B.†, Speck, C.†, Li, H.† (2013). Cryo-EM structure of a helicase loading intermediate containing ORC–Cdc6–Cdt1–MCM2-7 bound to DNA. Nature Structural & Molecular Biology 20, 944-951. Here we used a chemical biological approach to investigate which of the six potential Mcm2-7 interfaces functions during ORC-Cdc6-Cdt1 dependent helicase loading for regulated DNA insertion. Our approach involved FKBP and FRB fusions to neighbouring Mcm subunits, which upon rapamycin addition form a stable FRB-FKBP interaction and blocked DNA insertion. Having generated six constructs to cover all potential MCM2-7 DNA entry gates, we discovered that only the Mcm2/Mcm5 interface functions for DNA insertion during helicase loading at replication origins. Using our pre-RC in vitro assay, we showed that inhibition of DNA insertion triggers ATPase-driven complex disassembly, while in vivo analysis establishes that Mcm2/Mcm5 gate opening is essential for both helicase loading onto chromatin and cell cycle progression. Importantly, the work demonstrated that the MCM2–7 helicase becomes loaded onto DNA as a single hexamer during ORC/Cdc6/Cdt1/MCM2–7 complex formation prior to MCM2–7 double hexamer formation. This study established the existence of a unique DNA entry gate for regulated helicase loading, revealing key mechanisms in helicase loading. Furthermore, the system is very well suited to investigate in the future the role of the Mcm2/5 gate in related process, such as helicase activation or DNA synthesis. Samel, S. A., Fernández-Cid, A., Sun, J., Riera, A., Tognetti, S., Herrera, C., Li, H., Speck, C. (2014). A unique DNA entry gate serves for regulated loading of the eukaryotic replicative helicase MCM2–7 onto DNA. Genes & Development 28, 1653-1666. In 2017 we published the 3.9Å high resolution structure of a key helicase loading intermediate – the ORC-Cdc6-Cdt1-MCM2-7 (OCCM) complex. Here helicase loading was arrested by ATPγS, an ATP-analogue that can be only hydrolysed slowly. This international collaboration with partners in the US (Huilin Li and Bruce Stillman) and UK (Juri Rappsilber) revealed intriguing structural insights into the OCCM complex. We discovered that Mcm C-terminal extensions containing winged-helix-domains (WHD) that latch onto ORC-Cdc6 (see black circles). The WHDs are connected to the Mcm main body via flexible loops and in this way the whole ORC/Cdc6 – Cdt1/MCM2-7 interface is mobile. The function of this mobile interaction is not yet known. Importantly, here we described for the first time the structure of Cdt1. Different to previous models, Cdt1 mainly contacts Mcm2, which is part of the Mcm2/Mcm5 DNA entry gate. In addition, Cdt1 has a super-elongated C-terminal half, which wraps around Mcm6 and Mcm4. We speculate that these interactions are important to manipulate the opening and closing of the MCM2-7 ring. Crucially, the structure highlighted that ORC/Cdc6 are poised to hydrolyse ATP in the OCCM, suggesting a key role in Cdt1 release. How DNA is inserted into the complex and how the structure changes upon ATP hydrolysis is currently not known. Yuan, Z., Riera, A., Bai, L., Sun, J., Nandi, S., Spanos, C., Chen, Z. A., Barbon, M., Rappsilber, J., Stillman, B., Speck, C., Li, H. (2017). Structural basis of Mcm2–7 replicative helicase loading by ORC–Cdc6 and Cdt1. Nature Structure & Molecular Biology 24, 316-324.